When your days are not seeming as bright as they should be, it might be your windows and not your disposition! Having dirty windows can affect you in more ways than simply dimming your natural light. When you windows are in need of a fresh start, our Red Deer window cleaning gets the job done. If you think windows are tough, you are not wrong! After all, they are made to be left outdoors. As tough as your windows might be, they only stay that way with the help of proper maintenance. Glass is fragile, that is no secret, but you might not realize just how fragile it is! Instead of only being at risk of baseballs, your windows are at risk every time something new lands on their surface! Glass is a porous material, meaning that they absorb new materials. Over a long period of time, the average window can have many items seeping into the internal layers of their surface. This can lead to degrading from the inside out. This means that, without proper maintenance, your windows could be become damaged without you ever noticing! The secret to a good Red Deer window cleaning is listening to what your windows need. Instead of forcing your own treatment methods onto materials, work alongside them! 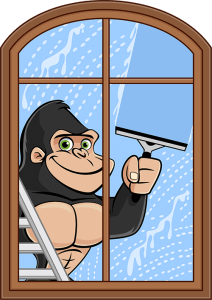 By using eco-friendly cleaning solutions, rubber squeegees and water-fed poles, our Gorillas can accommodate your windows at any level. 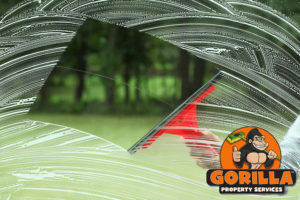 In addition to taking care of the glass itself, our Red Deer window cleaning extends to both sills and frames as well. Keeping an eye on all aspects of your windows can be difficult but with our Gorillas, you will never be left in the dark.